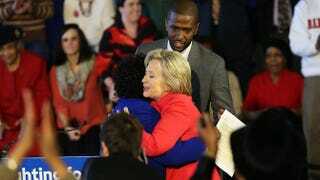 Democratic presidential candidate Hillary Clinton greets District Superintendent Thelma Sojourner before speaking to voters in South Carolina a day after her debate with rival candidate Bernie Sanders Feb. 12, 2016, in Denmark, S.C. Things tend to get ugly in South Carolina. It’s the state known every four years for when candidates pull out their dirtiest tricks to get the votes they desire. It was home of the hateful rumor about an “illegitimate black daughter” that marred Arizona Sen. John McCain’s race against then-Texas Gov. George W. Bush in 2000. This year, on the Republican side, it featured candidates calling each other liars and questioning their español bona fides, only for the game to end in another Donald Trump victory. For the Democrats, with everyone watching, it’s been less dirty tricks and more direct punches. But the fight is on for more than just the state that votes in its primary Saturday. Candidates Hillary Clinton and Bernie Sanders are going blow for blow over the black vote. South Carolina is the first state where the black vote makes up the majority of the voting electorate in the primary race. It’s a virtual bellwether for the black vote across the country. In the Palmetto State, black voters—and black female voters in particular—are more than 50 percent of the primary voters. Democrats need upward of 90 percent of the black vote to win the White House in the fall, and with no President Barack Obama on the ticket this time, Sanders and Clinton are moved to motivate the masses. Both candidates have attempted to show black voters that they are more in tune with the needs and desires of the black community. Black celebrities and surrogates from both campaigns have flooded the state’s historically black campuses, streets and major cities. Former NAACP President Ben Jealous and Professor Cornel West have taken to the TV and radio waves as well as traveled to South Carolina, pleading their case for Sen. Sanders; while high-profile surrogates such as Angela Bassett and the Rev. Jesse Jackson have campaigned for former Secretary of State Clinton. In a manner that caused as much backlash as the boost it hoped, the Congressional Black Caucus Political Action Committee endorsed Clinton for president. Within hours of the press conference, Rep. Keith Ellison (D-Minn.) and Rep. Barbara Lee (D-Calif.) came out and stated that they did not agree with the decision made by the PAC. But the CBC PAC endorsement isn’t what’s going to make the difference for Clinton in her effort to win the trust of black voters. It’s the voters’ memories. The biggest hurdle the Clinton campaign has to surmount is from its own doing in 2008. During the race between Clinton and then-Sen. Obama, former President Bill Clinton and then-Sen. Hillary Clinton were accused of engaging in race-baiting politics. During the lead-up to the contest, the 42nd president was recorded saying that “Jesse Jackson won in South Carolina twice, in ’84 and ’88, and he ran a good campaign. And Sen. Obama is running a good campaign.” Many blacks across the country believed that this was an attempt to degrade Obama, since it was known that the Rev. Jackson had failed to win the nomination on both attempts. Then Hillary Clinton made allusions that Obama could be assassinated. Though Obama seemed to forgive both Clintons for their statements, many black Americans have not removed them from their collective memories. Still, this doesn’t indicate a boom for Sanders. In fact, with a week to go in this primary, Clinton held a sizable 57.5 percent to 32.1 percent average lead over the senator from Vermont. Blog FiveThirtyEight has even gone so far as to say that Clinton has a 99 percent chance of winning the South Carolina primary overall. Noted film director Spike Lee’s endorsement notwithstanding, Sanders has a tough row to hoe in order to defy the skeptics and win over the black vote in South Carolina. Ready to register to vote? Want to know more about the issues this campaign season? Check out “Vote for Your America,” our Digital Election Guide, at YourAmerica.com. Join the movement and vote in 2016. Khyla D. Craine is a civil rights attorney and activist. Follow her on Twitter.